GreySellsGlobal's portfolio of regional activity and forecast maps. Maps now cover The North Sea, Mediterranean & Black Sea and South & East Africa. New maps planned will cover: West Africa and the US Gulf of Mexico. GreySellsGlobal offer free map distribution, to industry decision makers, at dedicated global events. Order free copies of the maps (postage payable). Each map will have multiple advertising opportunities, to suit all budgets. Each advertisement booking comes with voucher copies of the maps for the clients own distribution. GreySellsGlobal represent a unique group of business analysts and media partners. Available to help with project data, market strategy and forecast. Covering Renewables, Decommissioning, Life of Field, E&P, Floating Production Systems, Drilling and Project Contracts. Let us help you find your strategy support solution. GreySellsGlobal mapping is coming to hand-held devices. Users will be able to review projects locations and activity, quickly and easily with all standard hand held devices. GreySellsGlobal can publish, allow licence to, or originate bespoke map images to suit any client requirement. 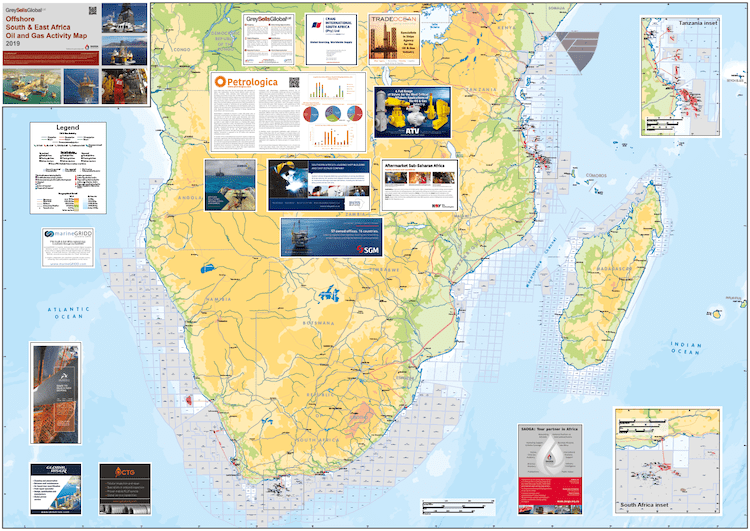 With over 30+ years’ experience in the publication and release of concise offshore oil and gas activity maps, many of which have now become industry standard reference sources. The company will continue the tradition of publishing high quality, user friendly, industry reference wall maps, with a fresh, topical and informative style. Photo Courtesy of Able UK Ltd.
Our maps have gone mobile via marineGRIDD. This Map has been published. Preview or get a FREE copy! (postage payable). marineGRIDD is a spatial, web portal-enabled digital mapping delivery system, it enables individual users and groups to access new or legacy data through digital maps on desktop, laptop or hand held devices, including smart phones and tablets, securely accessing data via 'cloud' technology. A simple, adaptable user interface provides instant access, allowing view and publish capabilities on the move. The complete series of maps will be directly targeted at exhibitors and delegates at major industry events, at which GreySellsGlobal will participate. As in the past, all maps published will be freely distributed, ensuring direct distribution to an industry specific audience. History, and experience has proven – freely distributed project reference material is eagerly sought after and gratefully received. To target your company at these decision makers, and optimise response from this focused audience, please give serious consideration to advertise within our products. All advertisers will receive voucher copies of the map for their own distribution. Please let us offer you a marketing choice. Submit your details and let us contact you. Copyright © 2018 GreySellsGlobal Ltd.